Joseph Franklin Rutherford, also known as "Judge" Rutherford, was the second president of the incorporated Watch Tower Bible and Tract Society of Pennsylvania. He played a primary role in the organization and doctrinal development of Jehovah's Witnesses, which emerged from the Bible Student movement established by Charles Taze Russell. Rutherford began a career in law, working as a court stenographer, trial lawyer and prosecutor. He became a special judge in the 14th Judicial District of Missouri at some time after 1895. 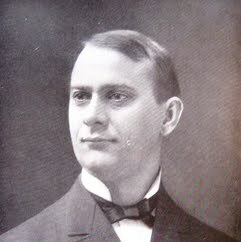 He developed an interest in the doctrines of Watch Tower Society president Charles Taze Russell, which led to his joining the Bible Student movement, and he was baptized in 1906. He was appointed the legal counsel for the Watch Tower Society in 1907, as well as a traveling representative prior to his election as president in 1917. His early presidency was marked by a dispute with the Society's board of directors, in which four of its seven members accused him of autocratic behavior and sought to reduce his powers.